Bickering has erupted again in the Congress even before election results are out. The latest expulsions by the Himachal Pradesh Congress Committee (HPCC) has stirred a controversy, with the anti-Virbhadra camp deciding to take up the matter with Congress chief Sonia Gandhi and terming the action as selective and arbitrary. Chief Minister PK Dhumal today said the state government had ensured women’s participation in strengthening the cooperative movement by providing them 33 per cent reservation in management committees of societies. He stated this while addressing a function at Bhareri in the district to celebrate the 59th National Cooperative Week after unfurling the cooperative flag. To combat the rising menace of reckless driving that result in fatalities on roads, the Mandi police has launched an anti-smoking, alcohol and drugs drive through a toll-free helpline to sensitise people in the region. Dr Jiva Nand Chauhan, general secretary, Himachal Medical Officers Association, today said Chief Minister PK Dhumal was considerate to the problems being faced by medical officers in the state in the last five years and most demands were acceded to. The next Chief Minister and his Cabinet colleagues can look forward to an innings in a completely new setting as the Secretariat is all set to don a new corporate appearance, replete with eco-friendly modular offices and furniture. The newly done-up office inside the Armsdale building. A flying squad comprising officials of the Mining and Police departments today confiscated a large amount of mining material on the government land near Bagbania. To gear up the party for the Lok Sabha elections, the Bharatiya Janata Party (BJP) today appointed the in charge for the four parliamentary seats of the state. Sensing that they may hold the key to power, rebel candidates of both the Congress and the Bharatiya Janata Party (BJP) plan to come on a single platform and form a political outfit. 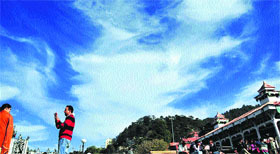 The Shimla (Urban) District Congress Committee (DCC) is up in arms against the decision of the Himachal Pradesh Congress Committee (HPCC) to expel its general secretary Sanjeev Kuthiala and sitting Shimla Municipal Corporation councillor Sushma from the party for six years for anti-party activities. 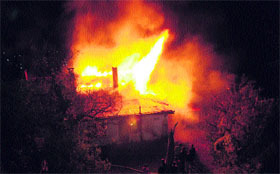 Over 20 houses and 18 cowsheds were destroyed in a fire that broke out in the remote Lawai village in Chhota Bhangal area of Kangra district today. No loss of life was reported. Over 300 residents were rendered homeless. Two persons were killed in road accidents during the past 24 hours, the police said here today. A leopard cub died on the way to the Gopalpur zoo yesterday. It succumbed to the injuries it received while trying to free itself from a trap laid by some villagers in the Baner forest of Suharghat, about 40 km from here. Jewellery and cash were stolen from house of Sumla Devi of Chalehali village under Kooh Manjhwaad panchayat, near here, yesterday. The anti-Virbhadra camp, including former HPCC chief Kaul Singh Thakur and former ministers Asha Kumari and GS Bali are likely to take up the matter with Sonia Gandhi shortly. Some leaders today brought the matter to the notice of Congress general secretary and Himachal affairs in charge Birender Singh. A majority of these leaders termed the expulsions as not only ill-timed, but also one-sided, guided by the principle of pick and choose. While former minister Singhi Ram from Rampur and Shimla Municipal Corporation councillor Sushma Kuthiala were among those expelled for six years yesterday, two more party men, Kartar Singh and Suresh Kumar from Bharmour, faced the music today. “As per the constitution of the party and following the principle of natural justice, the persons against whom complaints were received should have been issued a show-cause notice so that they were given the opportunity to be heard,” remarked Kaul Singh Thakur. He added that action should not be taken on the basis of hearsay and if there were complaints, those should have been referred to the Disciplinary Committee constituted by the AICC so that the allegations could have been verified before ordering expulsion. “I had given a list of those who openly worked against me during the elections. No action has been taken,” said Rajesh Dharmani, legislator from Ghumarwin in Bilaspur district. He said the rebel who contested against him openly flaunted the blessings of a senior leader. Many others, including Brig (retd) Rajinder Singh Rana from Dehra, Brij Bihari Lal Butail from Palampur, Ajay Mahajan from Nurpur, Kishori Lal from Baijnath and Kamal Kishore from Indora, had sought action against Congress leaders who openly worked against them, but no action had been taken so far. A majority of these leaders alleged that action was being taken only at places where candidates were Virbhadra loyalists while no action was taken at places like Kasumpti, Arki, Kullu, Chamba and Solan. In sharp contrast to the Congress, where the expulsions have triggered infighting, the Bharatiya Janata Party has decided to ignore reports of under-cutting, at least till the results are declared. Chief Minister PK Dhumal has dismissed reports of any serious complaints of under-cutting and has gone to the extent of stating that the doors of the party are open for rebels. He said there were 4,653 cooperative societies with 15.01 lakh members in the state now, with a shared capital of Rs 227.82 crore, deposits of Rs 11,786.88 crore and a working capital of Rs 15,912.30 crore, compared to 843 societies with 25,000 members during the First Five-Year Plan. He said the societies had released short-term and mid-term loans to the tune of Rs 5,100.28 crore and long-term loans for agriculture and non-agricultural activities amounting to Rs 68.69 crore to improve the economy of farmers, besides providing commodities valued at Rs 174.67 crore to consumers under the public distribution system. He said cooperative societies had marketed farm and horticultural produce to the tune of Rs 76.30 crore to fetch better prices to growers. He said self-help groups had been constituted through cooperative banks to inculcate the habit of saving among weaker sections and to empower women, with 75 per cent of the 61,664 groups women’s. 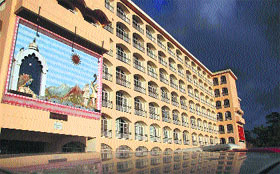 He said the second phase of the Integrated Cooperative Development Project had also been launched in the districts of Hamirpur, Bilaspur and Sirmaur with Rs 35.47 crore and approval had been accorded by the National Cooperative Development Corporation, New Delhi, to launch the second phase in the districts of Kangra, Kullu and Shimla with a grant of Rs 87.31 crore. ID Dhiman, Education Minister, and Ashok Dobhas, governing council member, National Cooperative Union of India, also spoke. According to an official analysis, drunken and reckless driving has turned out to be a major cause for the rising fatalities on roads in the state every year. An alcoholic, a drug addict or a smoker can seek help from the police through the toll-free helpline 1800 200 9449. Lighting a cigarette or driving a vehicle with high doses of alcohol or drugs are the major reasons for major accident deaths. The addicts were usually shy to get treatment from drug de-addiction centres or doctors. This toll-free helpline would give them constant advice to solve their issues, the police said. The truckers, who transport cement loads and drive in odd hours on national highways, allegedly use sedatives or drugs while driving that results in fatal accidents, it said. The police has registered over 325 cases of road accidents in which about 60 persons have been killed in the district this year. Last year, the police had registered about 350 cases of road accidents. Reckless driving due to alcohol or smoking had turned out to be the major trigger factors, the police observed. Dular said the service was a free advisory and it would advise them as to how to get out of these addictions through SMS on the registered mobile numbers. He said the Chief Minister initiated other steps to make radical changes in the Health Department with the intention to help poor patients visiting state hospitals. He added that these steps were not implemented at the bureaucratic level, due to which medical officers working in the state were demoralised. In a press note, Dr Chauhan said some major decisions for the welfare of doctors posted in the state were taken by the Chief Minister in the last five years. He said these included discontinuing appointment of doctors through the Rogi Kalyan Samiti, enhancement of MBBS and postgraduate seats in medical colleges of the state, granting of postgraduate allowance of Rs 5,000 per month and approval to mobile phone allowance to doctors. Dr Chauhan urged the Chief Minister to initiate earnest measures to fill all vacant posts of MBBS and postgraduate doctors in the state with regular appointments through the Himachal Pradesh State Service Commission so that rural health services were strengthened. He said it was a matter of concern that postgraduate doctors were leaving their jobs in the state and opting for private nursing homes. He said the government should come out with an incentive package for postgraduate doctors serving in the state. The State Administration Department (SAD) has rolled out an elaborate plan to give the Secretariat, office to 1,600 employees, a facelift to make it more public-friendly and work-efficient. The makeover, based on the go-green mantra, is being undertaken in a phased manner. It has already begun as two offices for secretarial staff and a retiring room for bureaucrats has been done. With a modern workstation for every employee, replete with space for computers and other office material costing between Rs 20,000 and Rs 25,000, the price for the new fresh look can run into a few crores. 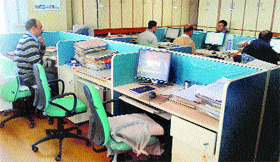 “We have embarked on the task of not only providing a proper workstation for every employee, but also creating a visitors’ room, an officers’ retiring room and a common room for the staff on all six floors of the Armsdale building and also at the old Ellerslie building,” says Sudripta Roy, Chief Secretary. The old Armsdale building, housing the offices of the Chief Minister, ministers and the Chief Secretary, will also don the new look. This building has about 125 rooms, much bigger in size than the ones in the new Armsdale building, which has about 200 rooms. “We intend to undertake the plan in a phased manner. The rooms of ministers will be done only after the new Cabinet is formed, as per their requirement and taste,” says Ajay Bhandari, Principal Secretary, General Administration and SAD. He says the basic motive behind the exercise is to provide a better work environment to employees, which will help increase efficiency and results in the optimum utilisation of space. The Secretariat, except the office of the Chief Minister, does not have any waiting room for visitors, resulting in people crowding the office of the personal staff of ministers and officers. “The furniture that we will provide is completely green-guard certified as it is mostly made of recyclable material and is thus eco-friendly,” says Kaplish Aneja, Assistant Manger (Sales), Godrej Inerio, which has been assigned the task. He says it will help improve the look and efficiency. The exercise will help do away with bulky furniture, which is not practical and occupies a lot of space. It will help create sitting space for more people and be more functional and practical. DSP, Nalagarh, Praveen Dhiman said as many as 585 trolleys of sand and 250 trolleys of stone was estimated to have been stocked along the Sarsa river and was supposedly being transported on the sly and had been amassed after the rains. The material was later auctioned in the presence of SDM, Nalagarh, Shubhkaran Singh. With the apex court banning mining in the neighbouring Punjab, the bordering areas of Himachal was facing an influx of illegal mining activity, which thrived during late evenings. The SDM had constituted several flying squads comprising police and mining officials to conduct raids across the industrial belt of Baddi-Barotiwala-Nalagarh to nab offenders. The illegal material was transported to Zirakpur, Mohali and Panchkula where several real estate projects were coming up and since transporters earned huge margins through this trade they did not hesitate to indulge in the same during late evenings and night. The SDM has directed officials to take action against offenders and initiating action under various Acts, including the Indian Forest Act if forest land was involved, and book the offender under Section 379, IPC, for theft. Action under relevant sections of the Motor Vehicles Act was also being initiated against vehicles transporting quarry material illegally. State BJP chief Satpal Singh Satti today said the appointments were made with the objective of gearing up the party organisation and complete the membership drive. Kripal Parmar, state BJP vice-president, has been made in charge of Hamirpur. Vipin Parmar, state BJP general secretary, has been made in charge of Kangra. Rajiv Bindal, former minister, is in charge of Shimla. Ram Swaroop, state BJP general secretary, is in charge of Mandi. Satti also constituted two-member committees for every district to complete the membership drive. The effort to bring the rebels of both parties on a single platform was started during the election process itself. Many rebels who had prospects of winning the elections had chosen the sewing machine as their election symbol. They had reportedly collaborated to bolster each other’s prospects. The Independent legislator from Nurpur in Kangra district, Rakesh Pathania, is playing a pivotal role in bringing rebels on a single platform. In an interview to The Tribune, he unveiled the plans of rebels. He alleged that both the Congress and the BJP had ignored the sentiments of local residents while selecting candidates for the recently concluded Assembly elections. Due to this, many rebels were in a winning position, he claimed. He admitted that rebels planned to come on a single platform and form a political outfit. “We are not averse to any party or individual in the post-result scenario. Rebels who win will bargain collectively with whosoever seeks their support after the declaration of results,” he said. “In case we are in a position to bargain, we will demand posts of board and corporation chairman for rebels who lose. We are in touch with leaders of national parties with an eye on the Lok Sabha elections,” he added. “We can also bargain for a parliamentary seat from the party that seeks our support during the next Lok Sabha elections,” he further said. Sources said the rebels were being approached by various factions and leaders of both parties with an eye on the post of Chief Minister. An interesting development was the meeting between Pathania and Rajan Sushant, BJP MP from Kangra. They were baying for each other’s blood before the elections. Sushant fell out with Chief Minister PK Dhumal and carried out a tirade against him due to the alleged importance being given to Pathania. Sushant’s wife was also denied the BJP ticket. She contested as an Independent from Fatehpur. The sources said Pathania and Sushant met yesterday to mend fences with an eye on the post-result scenario. Kangra district, which has 15 Assembly constituencies, has the maximum number of rebels. Some of these rebels are reportedly stronger than party candidates and are stated to be in the position to win. Dhumal and Shanta Kumar have already expressed the apprehension that rebels may play a crucial role in the formation of the next government. The signatories include two former legislators, Harbhajan Singh Bhajji and Adarsh Kumar, and a sitting councillor, Shashi Shekhar. They termed the expulsions as illegal, biased and against the norms of the party constitution. “The expulsions are an outcome of the animosity that some individuals hold against the two expelled leaders. They are carrying out a misinformation campaign and influencing the HPCC to take a wrong decision against committed party workers,” they rued. They said those responsible for the decision had worked against Sushma, the party’s official candidate, in the MC poll from ward 2. “Such people have been rewarded for anti-party activities with re-induction in the party,” they lamented. The fire was noticed around 10 am. It quickly engulfed the entire village. Within half an hour, hundreds of residents of adjoining villages reached the spot and doused the flames. Baijnath Subdivisional Magistrate GC Negi reached the spot. He directed the shifting of victims to temporary shelters in school buildings. He said the loss was being estimated by the revenue authorities. He assured the villagers that the state government would provide financial assistance to the victims at the earliest. Chief Minister PK Dhumal expressed shock over the incident. He directed Kangra Deputy Commissioner KR Bharati to extend all possible assistance to the victims immediately. He said financial assistance would be paid in accordance with the amended relief manual. It said Mast Ram (60) of Jol village under the Dehra police station was injured by an unknown man who was driving a scooter yesterday at Jol in a hit-and-run case. He was rushed to a Jwalamukhi hospital from where he was referred to RPGMCH, Tanda, and later to PGI, Chandigarh. He succumbed to his injuries on way to the PGI today. In another incident, 55-year-old Giatoo Devi, a resident of Ladwara under Shahpur police station, was hit by a car near Puhara village on November 15 and was rushed to Shahpur Hosiptal from where she was referred to the RPGMCH, Tanda, the next day. The victim succumbed to her injuries in the wee hours of today. A case has been registered against the driver of the car. It also attacked a villager who tried to help it come out of the trap. The victim, Hem Raj of Baner, was rushed to the Regional Hospital in Bilaspur for treatment. Forest officials reached the spot on being informed over the telephone of the cub getting trapped in a snare.The cub was taken to the animal dispensary in Suharghat. After initial treatment, forest officials decided to send it to the Gopalpur zoo, but it died on the way. The cub was more than two months old. The post-mortem examination was conducted at the animal dispensary, after which the carcass was burnt. Reports said Sumla, who is employed as a Class IV employee in the local government school, was on duty during the day and when she returned to her home in the evening she found all locks of her house broken and gold and silver jewellery and cash worth thousands missing.